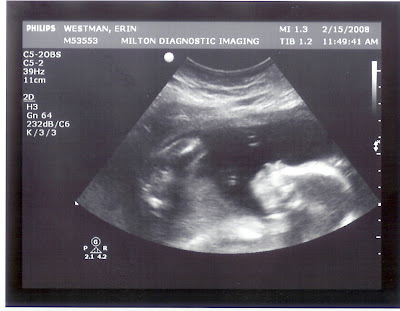 We've just had the 2nd (well really 3rd) ultrasound. 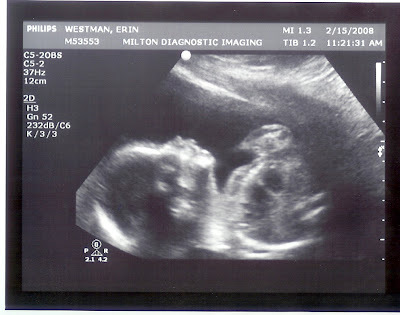 'Morgan' is a boy, which I am told I should be particularly happy about, but really 10 fingers, 10 toes, and healthy is really all I need. Anyways today is an approximation of 'Morgan's' half birthday, which isn't really the celebration of 6 months of life, but 1/2 way through the pregnancy, so we are celebrating with ice cream cake. All sides made concessions, I am a willing participant in what I think is something rather silly, in exchange I got something other then Mint Chocolate Chip as the ice cream in our cake. I will post some new pictures of the nursery soon! *Probably, I've been chastened against the certainty of ultrasound identification as being fallible, but were pretty darn sure.